• Volunteer teachers who have received extensive training by CitC Leaders on the Constitution and on teaching techniques will come into the classrooms to teach the lessons. • CitC leadership will schedule with administrators and/or teachers the days preferred by each school. • Lessons can be taught one day a week for five weeks, two days a week for two and a half weeks or every day for one week. • The days and times will be set that best fits availability of volunteer teachers and the school schedule. •	Lesson 1: Discovering the consequence of self-government under a Constitution in an amazing technology Leap; Learning of the Five Advantages of the Free Market Economics initiated by the new Constitution of the United States; Discussing principles of responsibility, hard work for rewards and success, and the incentive of property ownership are explored. •	Lesson 2: The Science of Government - Ruler’s Law/ Anarchy/ People’s Law, the study of government is a study of power and who controls that power. The Founders wisely provided for rule by the people with a republic. The unquestioned truth that the Constitution provided greater individual freedom than any other government of the world is presented. •	Lesson 3: The heroic accomplishments and the genius of the Founding Fathers are taught. The Declaration of Independence is studied and the wise, true principles enumerated by the Founders. The Declaration sets forth truth and that truth is of great value for students to learn. •	Lesson 4: The purposes and proper roles of government as defined in the Preamble of the Constitution are presented. Study of Article I in the beginning level lesson, and advanced levels cover all 7 Articles. 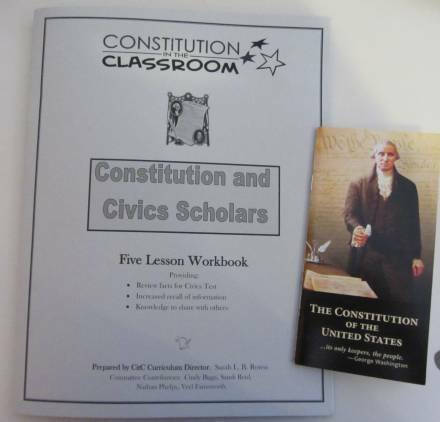 •	Lesson 5: Beginning level learns of Articles II and III, the Bill of Rights and a Sampling of Amendments. Advanced levels cover the Amendments more thoroughly. Emphasis is given to the truth that rights reside first in the people and that laws are designed to limit government infringement of individual rights. A careful review of previous lessons is included to help students retain what they have learned.